We accept players of all skill levels. Everyone can join, including those not affiliated with Purdue. Members should bring their own racket. During the scheduled club time, the courts are reserved for the club and only members are permitted to play. Guest player that is not a member will be charged $3 per practice (This is separate from Co-Rec guest pass fee). Dues can be paid in cash, check, or online. Instructions for paying online are in this document. 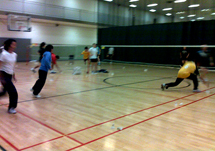 Purdue Badminton Club constantly travels to regional tournaments. A notification will be posted on our Facebook group regarding the tournaments ahead of time to ensure lodging/transportation for interested players. Our training session is held on a need basis. Training will be led by our coaches and experienced members who had proper training before. Only members can join this training. This training is the perfect chance to learn proper techniques and footwork. 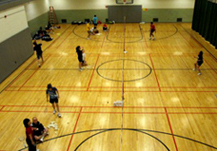 Purdue University Recreational Sports Center - Lower Gym. Guest (non-purdue students) fee for entering Co-Rec is $10.